I like this photograph of Cathryn showing Nikki how to quilt. A few weeks back, we were finishing up the quilt that belonged to Nikki and before it was absolutely done, she stopped by to do a bit of sewing on it herself. The moment was perfect and the sunlight on the quilt helped to capture the magic of Cathryn passing on the tradition. It seems ideal as we begin the new year to think of new things that we each can learn. Bev is mastering her smart phone. Renata explained how to do ice dying. Mary Louise is bravely taking on a major renovation to her house. I set 2016 as a year I am seriously going to focus on improving my writing. Nikki’s quilt is finished now so we began a new one. Bonnie pieced it and as always, it’s lovely. We are still discussing how it will be quilted but I have no doubt the final decision will be a good one. 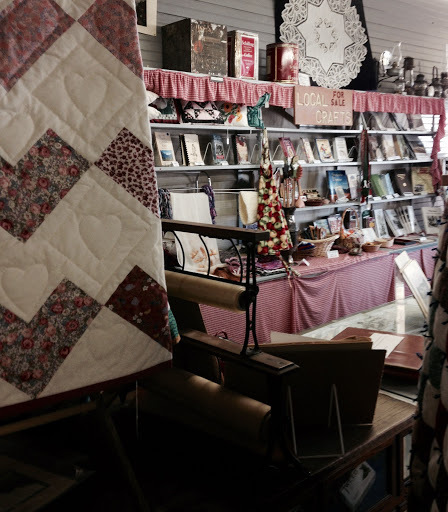 In the meantime, we have some items from the bazaar that we are selling and raffle tickets for the floral quilt to those visitors who stop by the old school house. You might think the cold temperatures and snow drifts would deter them, but nope. People still come in to see what we are working on, perhaps pick up a few belated gifts and catch up on news. I could surely relax into the calm pace of our Friday quilting but inspired by the other older quilters, I am determined to improve this year. There is a lot of hype to encourage people to shop local this coming Saturday. And there are all sorts of figures that show what a difference dollars spent in your community make compared to dollars spent online or in large chain stores. Its easy to see what a difference dollars spent at the Historical Village bazaar makes. 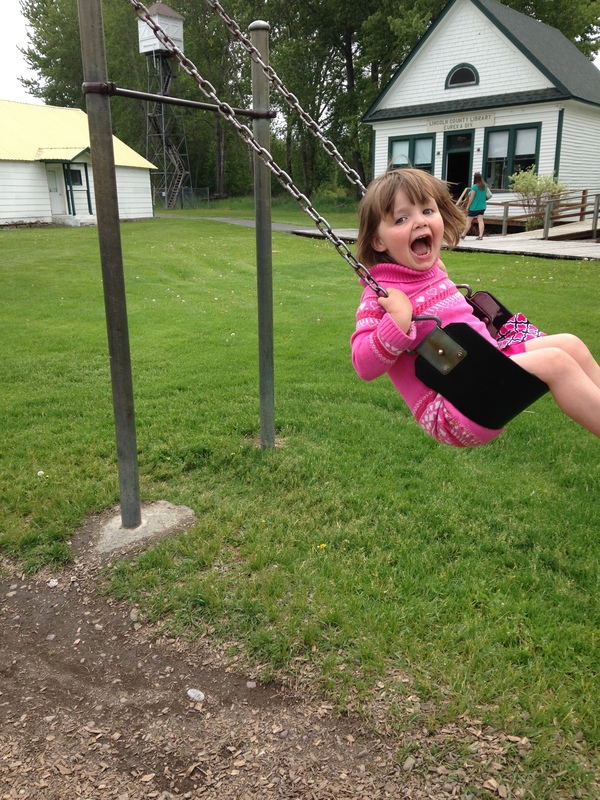 All the money goes directly into maintaining the Village. There isn’t a percentage to the group putting the bazaar on, no fee charged for tables. Everything in the bazaar is made by the quilters and donated. That makes for a very easy equation. One hundred percent of the price you pay for an item goes directly to helping the Village represent the history of this valley. Of course there are other bazaars happening in the Tobacco Valley on December 5 – actually seventeen if you can believe it. All have wonderful gifts to offer you and yours. But of course my favorite is the one at the Historical Village. Hope you can stop by. That time of year again. Shakespeare in the Park happens this Tuesday (August 25). The county fair is the coming weekend. Then the picnic for all the volunteers who helped with the Historical Village this summer takes place on September 2 with Lynda and Lewis grilling hamburgers for us all and lots of potluck salads and desserts. 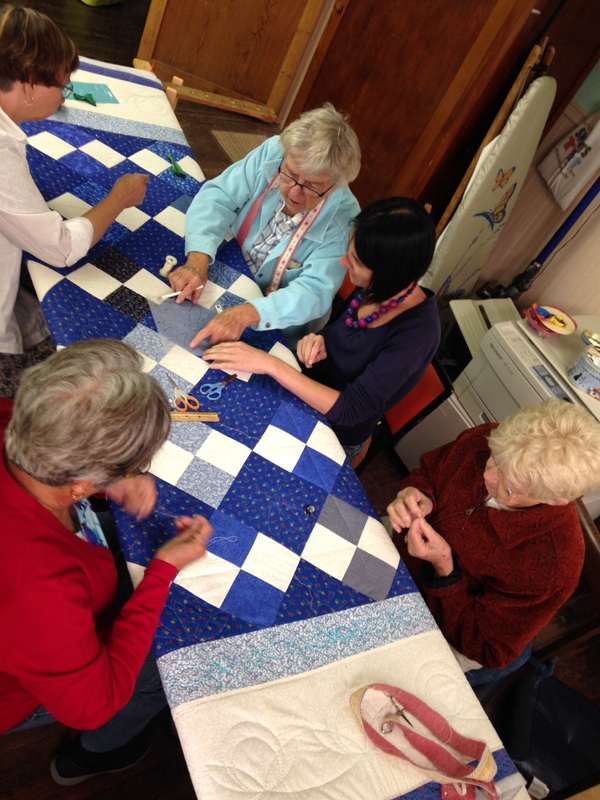 A group of us continue to meet on Friday mornings to finish the blue quilt. This past week a young Czech woman, Martina, was there to learn quilting techniques with us. Bev was very patient demonstrating how to sew through all three layers and make knots that don’t show. Martina caught on quickly and the women agreed that she was a keeper. As she makes beaded jewelry, I guess it is not a surprise that she can take small neat stitches. But for me it not just the new quilting skills that were valuable for her but the exposure to these women. Talking about their life experiences, cracking jokes, giving each other advice – they are such great examples of how to age with grace. There isn’t any grumbling about pesky neighbors or inept politicians. There wasn’t excessive complaining about aches and pains. No one bemoaned inattentive children or the prices at the grocery store. Rather than digging a hole of despair, they build joy. Often I wonder how good people can make a difference when there seems to be so many problems and sorrows to contend with in the world. This group of quilters has found a way. They support each other and set a standard for doing well and I’ve no doubt this impacts our community in a positive way. And although it would be hard to prove, I imagine this positive impact also reaches out beyond the Tobacco Valley as well. I am very glad Martina got to experience this for even one morning. It somehow went from feeling like summer was just beginning to here we are perched on the edge of August. Tomorrow is the 11th Annual Eureka Montana Quilt Show. Everyone is getting ready from the guys who wash the streets to the women sorting the quilts so they will be ready to hang up first thing tomorrow. Of course my favorite time is around 7am tomorrow when the day is still young and the crews are out hanging quilts up and down the main street, on the buildings in the Historical Village and in the parks. The vendors will be setting up. This year the RiverWalk committee is selling breakfast next to the Historical Village as a fundraiser so we can all get coffee and pancakes by 8am. This day really is an event that everyone participates in. The electric co-op with their trucks will hang the quilts that go high on the old buildings. Businesses will hang the quilts on the main street and then ‘police’ them during the day (“Please don’t get your ice cream cone near that quilt, ma’am”). And the town will explode with colors. Everywhere you look there will be patterns and designs in every hue. A nine-square there and an appliqued one over there. The tiniest quilts (minis) will hang in the old library at the Historical Village. The patriotic ones in reds, whites and blues will brighten Memorial Park. You can vote for your favorite quilt of the over 600 that will be displayed in town and later these votes will be tallied to determine the “People’s Choice”. But it is always so difficult to decide. 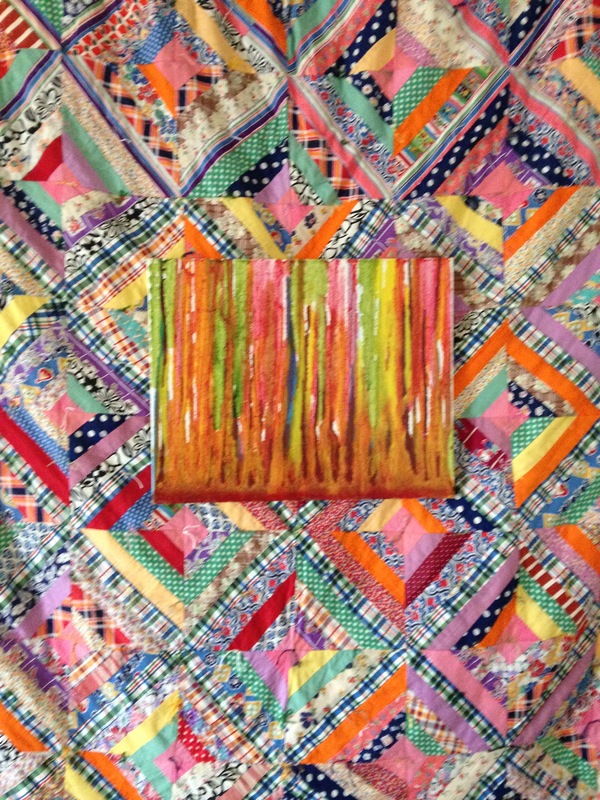 How is it possible to compare a large quilt with pieces that look like a mosaic to a smaller one that has been hand embroidered? Or that one that is so unusual to the one made of all different white fabrics? There must be a word when there is too much for your eyes to take in. That’s the Quilt Show. At some point during the day, take a break in the Historical Village Museum where it will be a tad cooler and with sounds and colors muted. There’s even a sofa there to sit on as you think about which quilt to vote for. It isn’t really midsummer but it feels like that with the heat these days. Thus when I go to quilting on Friday mornings, I tend to forget to take any photos. It feels like enough to just sit there and stitch when it is this hot. And as it is summer, there tends to be a lot of tourists passing through the Historical Village and visiting with us which is another distraction that I could blame things on. Still here I am writing and I did find a photo that I like very much from the spring. Lynda, Carmen and Joan stitching away. Judy going off to find something in the background. A second quilt set up behind her which is the one we are currently working on. Summer. Judy is busy getting ready for the quilt show in August as she will surely enter a lot of pieces that she made as well as helping with the show’s organization. Joan is getting to be a wiz selling books on Amazon and putting up her usual gaggle of summer guests. Carmen has gardens upon gardens that she cares for growing flowers and vegetables. Lynda keeps things straight at the Historical Village (there was a wedding there last week! ), goes birdwatching and looks after the grand kids. It does astound me that all these women are so consistently busy, not in a don’t bother me kind of way but with activities that keep them fresh and the community a better place. And there they are in this photo, all in one place looking relaxed. 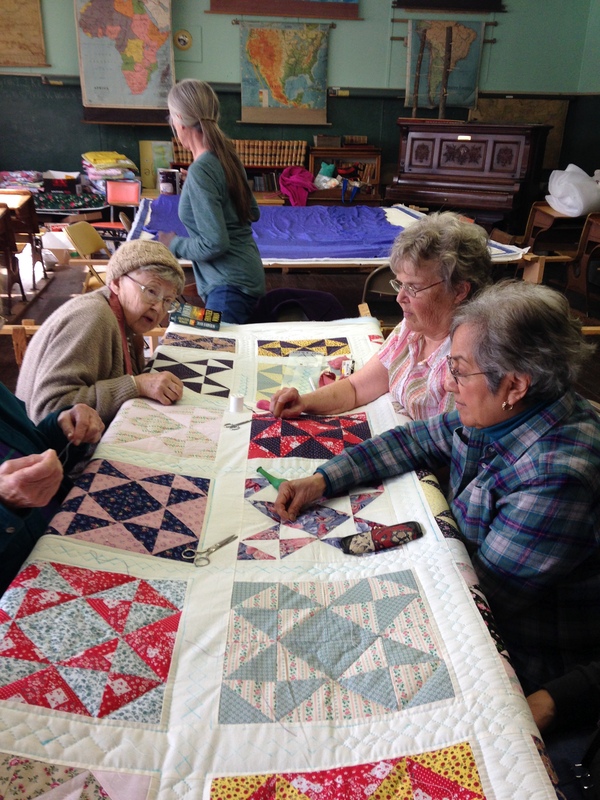 For as many years as some of these women remember, we have had quilts in the closet waiting to be done in the fall. Some were quilts tops that someone in the valley had gotten from a grandmother or great-aunt that needed to be hand quilted. Others were newer ones someone pieced and didn’t have the time to hand quilt so brought it to the Historical Village for the women there to work on (we recently finished one for a woman in Texas!). Our fees are incredibly reasonable for the amount of work it takes. And our fees are incredibly important because it is by charging for hand quilting that we raise money to help maintain the Village. But this Spring…and yes I know it is still only early April….we don’t have any quilts in the closet for fall and its a bit disconcerting to some of us. We can always make our own quilts to raffle or sell but that usually doesn’t bring in as much money for the projects in the Village. So Lynda asked if I would help get the word out. I am letting all of you who read this blog know and perhaps you will even share with your friends that we are looking for those special individuals who need hand quilting done. In trying to decide which photo to use for this, I opted for the beautiful colors of one that Carmen’s mother donated to us. It was pieced back in the 40s or 50s. We hand tied it because the fabrics and style called for that. And I admit I couldn’t resist and bought it when it was finished. Now it is hanging in my living room as a background for a Derek Trotter painting. But I shouldn’t get sidetracked by the colors…thanks for helping to get the word out that we are looking for quilts that need to be lovingly sewn by this very special group of women.